Initially, the Pendet Dance was the worship dance that often was exhibited in the temple. The dance that was created early of the year of some seventy by the artist I Nyoman Kaler this, depicted the reception on the fall of gods and goddesses to nature marcapada that was the statement from a dedication in the form of the ceremony dance. Gradually, together with the development of the time, the Balinese artists changed Pendet into "congratulations came", although continuing to contain the element that sacred-religious. Flower sowing was spread opposite the guests as the expression welcome. Pendet was the statement from a dedication in the form of the ceremony dance. Unlike his matter dances showed that needed the intensive training, Pendet could be danced by everyone; pemangkus the man and the woman, women and the village girl. This dance was taught only a with followed moved and rarely was carried out in series. The young girls followed moved from the more senior women who understood their responsibility in giving the good example. The Pendet dance was the dance of the daughters who had the pattern of the movement that was more dynamic than the Horoscope dance that was brought in groups or teamed up, was put forward after the Horoscope dance in the page of the temple and usually appeared to the side of holy (pelinggih) by putting on ceremony clothes and respectively the dancer brought I, the pitcher, the cup and other ritual offering equipment. Most people are familiar with the temple at Tanah Lot from articles and travel brochures; it is certainly one of the most photographed spots in Bali, and for good reason. The temple was originally built on a spit of land which was connected to the mainland by an arch a land bridge. An earthquake destroyed the archway, leaving the temple standing alone on what is now an island. At high tide, the temple is completely cut off from the land and waves break dramatically on its shores. 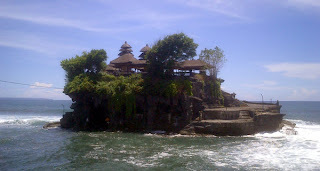 The proper name for Pura Tanah Lot is Pura Pakendungan and it was founded in the 16th century. According to legend, entry to the temple is guarded by sea snakes. The temple is closed to visitors, which is probably a good thing given the large number of tour buses that come every day. Most people come for sunset, so if you want peace and quiet, try visiting at another time. There are some trails that allow you to wander around a bit and explore some other lesser temples. There is also a well-established bevy of touts and vendors, should you want to do a little souvenir shopping or get something to drink.